MINNEAPOLIS, June 26, 2017 — Perforce Software, a provider of solutions to DevOps teams requiring massive scale, visibility and security along the development lifecycle, has been named one of the Top 150 Workplaces in Minnesota by the Star Tribune. 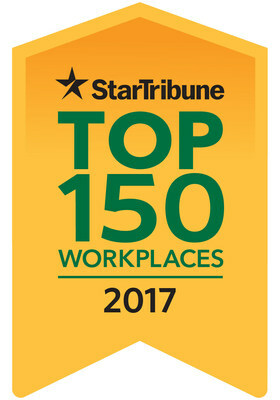 A complete list of those selected is available at StarTribune.com/topworkplaces2017 and was also published in the Star Tribune Top Workplaces special section on Sunday, June 25. Perforce Software was ranked twelve on the small company list, out of a total of seventy companies. "Perforce opened its Minneapolis office in January of 2016, and we are very proud of the fact that we have already earned a top workplace in Minnesota," said Janet Dryer, CEO of Perforce. "We have grown to over fifty employees in Minnesota out of over 225 global Perforce employees, and creating a focused, fun and rewarding work environment is key to our continued success here and around the world." Star Tribune Publisher Michael J. Klingensmith said, "The companies in the Star Tribune Top 150 Workplaces deserve high praise for creating the very best work environments in the state of Minnesota. My congratulations to each of these exceptional companies." Enterprises across the globe rely on Perforce to build and deliver complex digital products faster and with higher quality. Perforce offers complete project lifecycle management tools to accelerate a project's delivery cycle by linking the requirements, issues, test plans, source code, binary assets and all artifacts in an integrated platform. The company's solutions securely manage change across all digital content – source code, art files, video files, images, libraries - while supporting the developer and build tools your teams need to be productive, such as Git, Visual Studio, Jenkins, Adobe, Maya and many others. Perforce is trusted by the world's most innovative brands, including NVIDIA, Pixar, Scania, Ubisoft, and VMware. The company has offices in Minneapolis, MN, Alameda, CA, Mason, OH, the United Kingdom, Germany, and Australia, and sales partners around the globe. For more information, please visit www.perforce.com.